The topic was of great interest – to explore those misconceptions about how we work, preventing us from maximizing our success. As a follow-up, we want to invite you to participate in a bevavioural economics research study in cooperation with Queensland University of Technology, Australia. 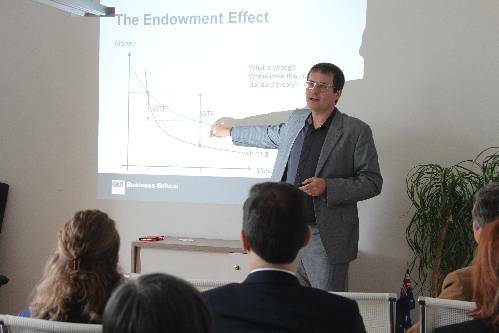 Prof. Uwe Dulleck, our guest lecturer from Queensland University of Technology gave us an introduction to behavioural economics, the science exploring linkages between economics and psychology. Economic decision-making is not simply the rational process suggested by traditional economic theories, but a process influenced by how problems are presented and by our personal preconceptions. The first experiment Dulleck carried out, also called “The Monkey Business Illusion” provides us interesting insights into the ways we think. If you would like to see for yourself, click on the following link and count how many times the players in the white t-shirts pass on the ball. Did you see the gorilla? If not, don’t worry. 50% of those participating in the experiment do not see it. When focusing our attention on only one aspect of the world, our capacity to perceive other things is very limited. We tend to see only the things we are looking for; in this case the white players and the ball. The problem is that we often ignore things we would be well-advise to notice! Did you, once the gorilla was pointed out to you, say “I would never have missed something that important”? According to Daniel Kahnemann, author of “Thinking, Fast and Slow”, this reaction is common but reflects a kind of overestimation of one’s attention to detail and a resulting cognitive distortion. Tending to trust one’s own abilities, perhaps too much, causes an excessive optimism that forms part of the most important cognitive dissonances. The name and the concept of “Nudge” or the “Nudge Theory” were developed and globally taken up by the book “Nudge: Improving Decisions About Health, Wealth, and Happiness“ (Thaler & Sunstein), published 2008, an international bestseller. This and the bestseller Kahnemans book from 2011 „Thinking, Fast and Slow” are based on the fundamental Kahneman-Tversky theory. 2002 Daniel Kahneman was awarded the Nobel prize for economic sciences. Further studies show that people tend to make irrational decisions based on psychological and neurological distortions that can be unfavourable to their own well-being. Our responses to complex decision-making tasks rely on so-called heuristics that help minimize time and effort. For example, information more rapidly available to the brain is classified as more important. Also, anticipated losses are perceived as more painful than potential gains while future rewards are discounted compared to current pleasures. The results of this analysis also show that people are influenced by social norms and the conduct of their peers. They react slowly to changes and tend to stick with once chosen options or behaviour patterns. These and further heuristics and psychological distortions lead to people not being able to stop smoking, stay with healthy diets and exercise regimens. We see similar behavior as consumers, for example, refusing to sign up for occupational pension schemes or to open up a bank account with better conditions. The Nudge theory is based on the idea to take up these applied heuristics and use them to steer human behaviour in the right direction to encourage better decisions. Based on the results of these studies, it seems that there are invisible limitations we all must face, limiting our capacity for rational decisions. When faced with several possible choices these choices are influenced by the context (decision-making architecture). Nudging should be “nudges in the right direction” and should optimise human behaviour without limiting the actual options. The Nudge theory is a radically different and highly developed approach to help people make changes. Compared to traditional approaches, there are no direct instructions, prohibitions and punishments. This method uses psychological effect mechanisms. Cost effectiveness: because the Nudge concept does not contain any punishments and prohibitions there are no costs for supervision and enforcement. Easy implementation: The idea of nudging is based on behavioural changes via “nudge in the right direction” impact is made with minimally changed structures and presentation of decision making options. The use of a Nudge is a middle way between the options “not doing anything” and “prohibitions, punishment and rewards”. The behaviour of a person is specifically influenced by maintenance of all possible decision making options. Take part as a company at our exciting behavioural economics study! How does a Nudge measure in a company context influence performance measures such as economic indicators as well as subjective (heart rate variability) and psychological variables? If you are interested in participating or want to receive further information do not hesitate to contact andrea.ristl@autonomtalent.com or call +431 5234320. Contact us as well to build an important decision-making foundation for further change processes!